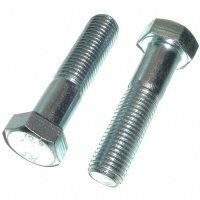 Metric hex bolts (hex head cap screws) grade 10.9 with coarse thread and zinc plated steel. Our grade 10.9 hex bolts / cap screws are very popular with the automotive industry. Metric grade 10.9 bolt pictures are a general representation and not an actual picture of the product you will receive. Threads will vary according to the individual bolt sizes and dimensions. ISO standards for threads are: length is twice the diameter of the bolt plus ½ inch. If you are looking for fully threaded bolts please call direct at 800-872-5557.